I am so excited to announce a collaboration with Sarah Winward in a few weeks time. An afternoon of flower filled fun here in Yorkshire, UK on 31st May 2017 12-4pm at Holme Flowers near Thirsk, North Yorkshire. A relaxed, half-day workshop on a flower farm where you will forage for dramatic branches, work with flowers grown on the farm and design your own giant urn. There will be lots of lovely Yorkshire tea and home made cakes and all on a working farm so lots of cows, sheep and all that entails!!! Sarah is one of my all time favourite designers and I feel so privileged to be working with her, her work is hugely influential around the world. If you've ever pinned a drool-worthy image of a floral installation or stunning bouquet, chances are that Sarah has created it! 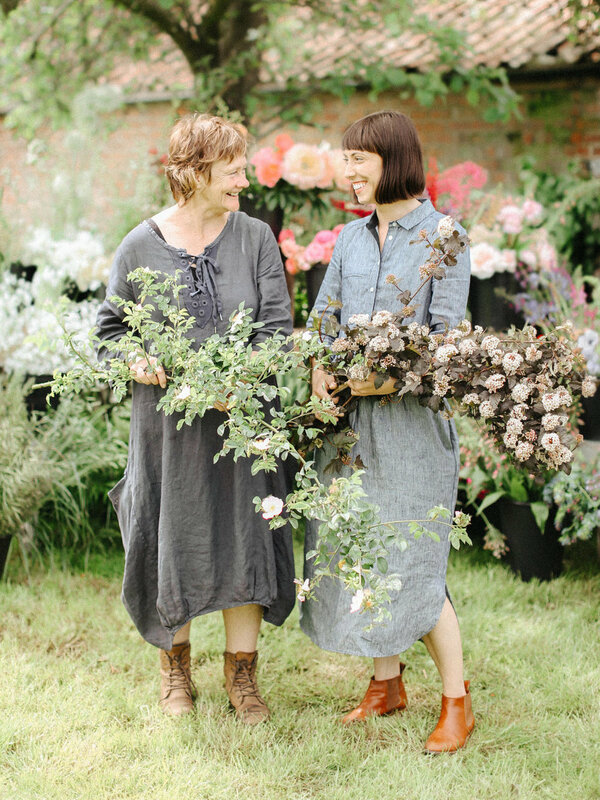 I first met Sarah down in the Cotswolds a couple of years ago, after watching her design incredible bouquets and striking urns, we bonded over a morning foraging the hedgerows for wild clematis and huge urn making. We have kept in touch since and I have been longing to show her the beauty of the rugged, wild and earthy Yorkshire. I've often driven down our tiny lanes bursting with May blossom, just big enough for my van, across the windswept moors purple with heather, or by the local huge craggy rocks with determined little ferns bursting through and thought 'Sarah would love this' and made mental notes where I would take her (I'm afraid I've forgotten half of them!). And rather fabulously she is now actually coming up and I just know she will love it all. From the tree lined valleys here in my little piece of heaven in West Yorkshire, through the local 'wuthering' Bronte moors and creative towns of Hebden Bridge and Saltaire, up to the more gentle and picture postcard prettiness of North Yorkshire with it's array of market towns and farming folk, Yorkshire has so much beauty to offer and such a varied landscape, each beautiful in it's own very different way. I am so excited to see Sarah's reaction to it all! So, Sarah and I have put together a very relaxed yet inspirational half day of flower-filled creativity for anyone who just wants to share their love of flowers and enjoy a bit of "impulse designing" with us, this is a fabulous opportunity to get to work with one of the world's leading floral designers while she is over in the UK. Holme Farm is a beautiful working farm run by three sisters, Wendy, Sue and Jayne and is located in a delightful and secluded hamlet in rural North Yorkshire. 12 noon Arrive for a light lunch served under an apple tree in the orchard*. A chance to meet and chat to everyone in the most idyllic of settings. Enjoy a relaxed lunch of locally reared meats, local cheeses, fruits, breads, biscuits, English wines and soft drinks as well as home made biscuits and cakes. And of course lots of Yorkshire tea. After lunch Sarah and I will demonstrate our urns, then we'll all head off to one of the flower fields before meandering down some of their many lanes or across open fields to forage for interesting foliage. You will then choose your vessel and create your own floral masterpiece in the beautiful orchard. Photos throughout the afternoon by fine art photographer Holly of Belle and Beau www.belleandbeaublog.com Holly has been internationally recognised as one of the best Fine Art Wedding photographers in the UK with accolades from The Telegraph and Photo Professional Magazine. She is also the author of ‘The Fine Art of Wedding Photography‘. To book a place please e-mail Fiona at fiona@firenzafloraldesign.co.uk and she will reply with payment details. Places are strictly limited and allocated on a first come first served basis. Demand for this half day workshop is expected to be very high and early booking is HIGHLY recommended. The hamlet of Holme is about a 10 minute drive from junction 50 of the A1/M and a 15 minute taxi ride from Thirsk station- full directions will be sent out to all attendees beforehand. *We have an indoors wet weather back up plan in case the weather isn't kind. Amazing windows, panelled walls, fireplaces big enough for small countries to huddle around, un renovated and peeling walls beautiful beyond belief, original and full-room mural from a Staithes Group artist, Arts and Crafts architecture. And the flowers of course, don't forget the flowers. Picked from my gardens and other local artisan growers and foraged from the tangled, overgrown, fairytale wilderness outside this magical place. A small group of like minded floral artists and creatives gather excitedly waiting to design, create and weave their magic about this amazing place. This will be the 'Gathering Blossom' workshop in April. (Named after a painting by the Staithes Group artist, Frederick William Jackson). I can't wait for you to see this place!! !